The Home Decorators Collection offers a variety of decorative rod sets in styles ranging from arts and crafts, modern, classic and cottage. The Quarter Foil rod set has a 1 in. diameter rod that is available in 36 in. - 72 in. and 72 in. - 144 in. lengths. The black/gold finish will complement a wide variety of decors. Rod extends from 72 in. to 144 in. Use LEVOLOR accessories to complete and/or complement your window solution. 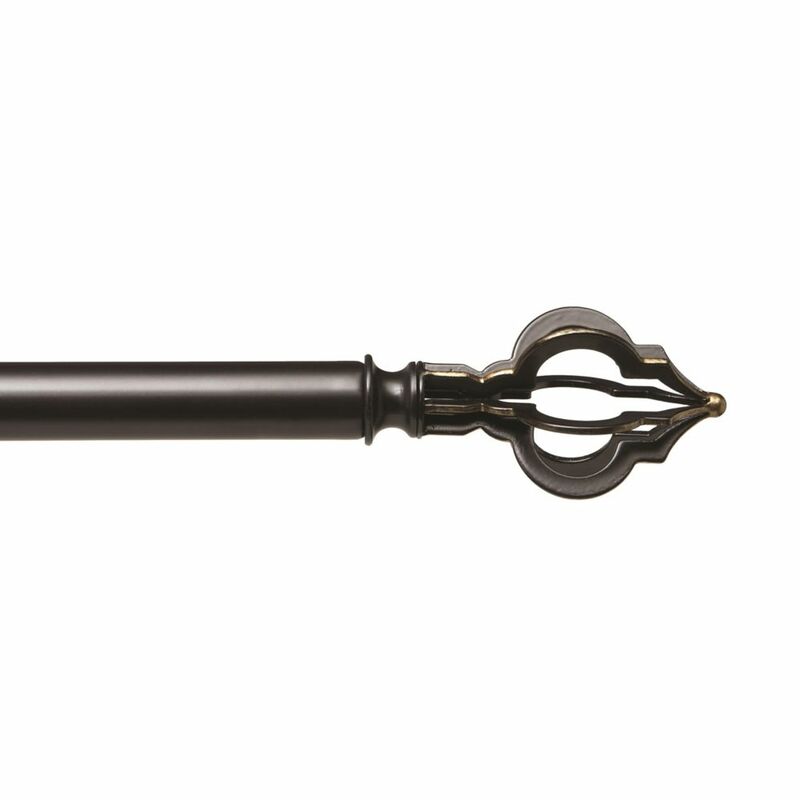 The Home Decorators Collection Oil Rubbed Bronze Fluted Wood Tone Rod Set will bring a timeless look of elegance to a wide variety of decor. Versatile with a telescoping design for rod adjustment, this set is easy to install with instructions and hardware included. Ideally suited for any room in your home, this set is classically styled and will help you pull together timeless rooms you will enjoy for years to come. The Home Decorators Collection wall end pack includes 2-pieces of wall ends that fit curtain rods for 0.75 in. to 1 in. diameter and mounting hardware for easy installation. It is a great solution for an inside mount within windowframes or for a mount between two walls. The Home Decorators Collection corner connector pack includes 1-piece of corner connector that fits curtain rods for 0.75 in. to 1 in. diameter and mounting hardware for easy installation. It is a great solution for a seamless mount in bay windows. 1 Inch Quatrefoil Rod Set 72-144 Inch Black/Gold The Home Decorators Collection offers a variety of decorative rod sets in styles ranging from arts and crafts, modern, classic and cottage. The Quarter Foil rod set has a 1 in. diameter rod that is available in 36 in. - 72 in. and 72 in. - 144 in. lengths. The black/gold finish will complement a wide variety of decors.